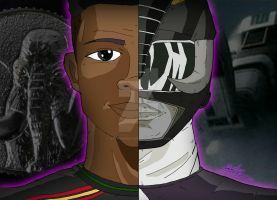 This was my second design for the Power Rangers contest over at welovefine. I was a little too old for Power Rangers when it came on television, but my little next door neighbor was really gung ho about it, so I ended up seeing a lot of it when he would be hanging out over my house. I was (and am) super into the anime / manga art style, though, so I decided to draw the characters in anime style. WOW, a Rumiko Takahashi version of the Mighty Morphin Power Rangers !!! lol, yeah... i guess it kind of shows that I'm influenced by rumiko takahashi, huh? Loved that show as a kid! Tommy will always be my favorite ranger, as he was always the most badass one when I was growing up. I think I'll cosplay as him for my next gauntlet race! 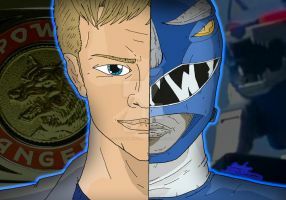 I was a little older when power rangers came out, but my little next door neighbor LOVED it. I would watch it with him when I was babysitting him. I did think Tommy was pretty cool. It was a good show. I'll introduce my son and daughter to it when they're old enough. But just the original ones. I really loved the ninja season, and just any of them where the zords turn into animals. I don't think I could take Jason seriously if he had Ranma hair. Especially not if he changed into a girl when splashed with cold water! It's been a very long time since I've seen power rangers... but I remember how crazy my little next door neighbor was about them. 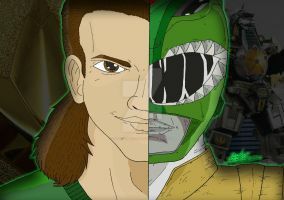 I must've seen the green ranger vhs tape he had about 9,000 times. Thank you so much! That really means alot! I actually prefer the original Japanese series super sentai. I've never seen the japanese version, but I would love to. I mean I hope you like Ranma 1/2, because I sure as hell do, and this is basically Ranma Rangers. Which I would totally watch. Lol, yeah, I love Ranma. That's how I learned how to draw anime and stuff. Thanks! There is a lack in songs about bananas being great/grand. 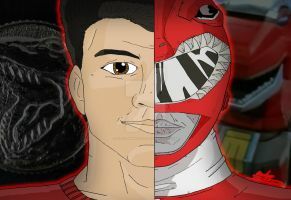 Bananas are great, bananas are grand, I drew the power rangers as fast as I can. And many Zords! I know. I have to go lie down now. I'm kinda pissed off of the kind of dragon on Tommy's section. It's not that kind of dragon! It's a godzilla. Yeah, I know. I knew someone was going to say that as soon as I started to draw this one. Sorry. 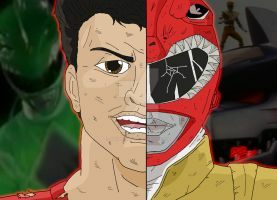 The title of that zord mislead people. They should have just called it godzillazord. I just love how delightfully politically incorrect the original series was. 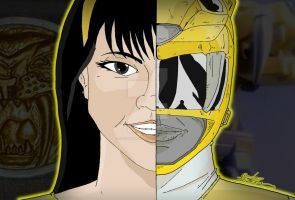 Yellow ranger: Double whammy of both a girl AND Asian. They'd never get away with it today, but it's hilarious to me. hah hah hah, yeah. It sure was. Yeah, I learned how to draw from watching a lot of rumiko takahashi cartoons (i.e. ranma) and her guys always sort of looked like girls, lol. 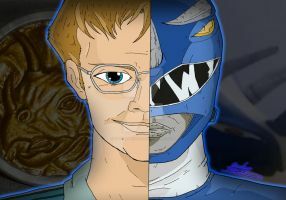 You're right, billy does sort of look like a humanized simon, I didn't even notice that. He also looks exactly like one of my friends, and I didn't notice that, either, until I had finished this. also, your little running chipmunk avatar is adorable! Why thank you! ^^ That's my chipmunk-sona, Austin. Well, he is adorable! I was always a fan of Theodore from the Chipmunks. Obviously I'm a big fan of Simon Thanks for the compliment! I haven't seen power rangers in so long. We were just playing the snes game not too long ago, though.